albert camus | Thots and Expressions..
Posted by Afrozy Ara in Book Reviews, Classics, Mumbo Jumbo. For quite some time now, I have been pondering over The Ultimate Question. Is it something to do with our surroundings? Is it significant because of our experiences? Does this life have meaning in itself, or is it valuable only when lived amongst people we love? In short, you can call it momentary pangs of self existential dilemma!.. Of course, I’m not the first one to ask these questions. For centuries, men have pondered over the same. So, it is an eerie coincidence that at a moment when I was stung by these questions, this book by Albert Camus seems to have “accidentally” strolled into my life. 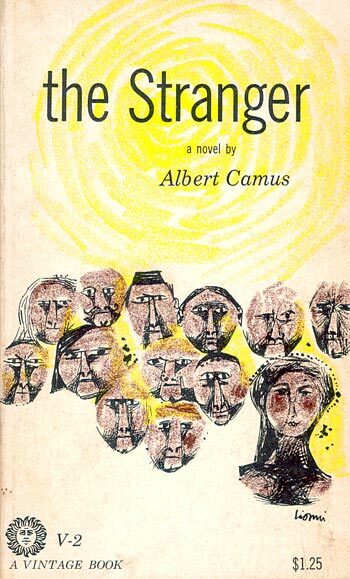 “The Stranger” is a personification of the self existential dilemma. It is a queer book. Starting abruptly, you are introduced to a character who seems to be totally apathetic to his surroundings. He has this uncomfortable air of careless indifference which makes you wonder – What’s wrong with this guy? Is he a sociopath? Meursault is a man out of touch with things on an emotional plane – who considers everything around him with an objective mindset. He gets along well with people, but they hardly touch an emotional chord in him. He either finds people interesting or boring, and usually agrees with them to avoid confrontation. And then a freak incident happens when he accidentally kills another man and is sent to jail. The case is brought in court, and Meursault’s indifferent attitude towards the murdered man horrifies the judge. He is served a death sentence. The last few chapters deal with how he deals with this sentence, contemplating on what really matters to him. Why should he look forward to living his life? Is it a relation with his girlfriend? Is it about experiences with the world outside the walls of the prison?.. Is it the pleasure of seeing the sky and watching the stars?.. Moments of freedom? What is it that makes his life worthwhile?! The book is a French translation. Seems to be very simple but holds a lot of symbolism – the concept of death brought in to contrast with the value of life. Not much of a leisure read, it would pass off more as dense stuff for an advanced literature class. The book does not tell you much, but makes you think a lot. So… What exactly is the purpose of our lives?? A plausible solution to this questions came from an unlikely source. A musician must make music, an artist must paint, a poet must write, if he is to be ultimately at peace with himself. What a man can be, he must be. This tendency might be phrased as the desire to become more and more what one is, to become everything that one is capable of becoming!.